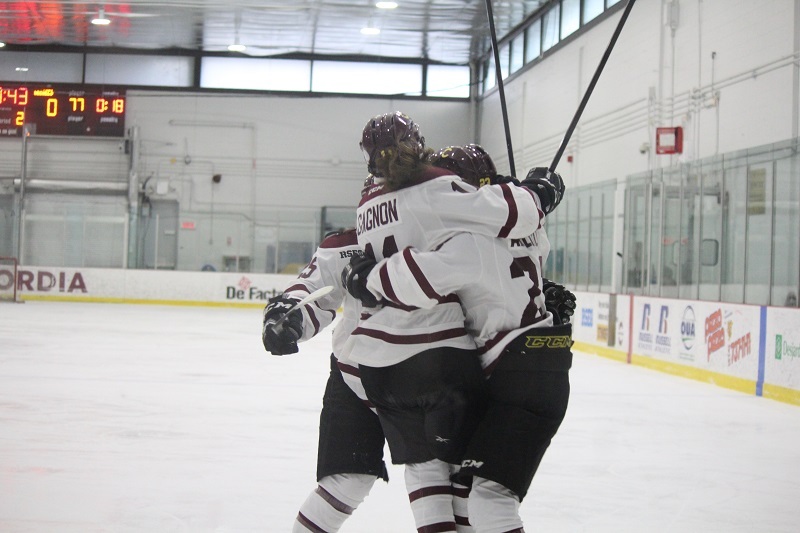 After losing game two on the road on Feb. 24 and with their season on the line, the Concordia Stingers women’s hockey team was forced to play a third game at home on Feb. 25 in their playoff series against the Ottawa Gee-Gees. The Stingers came out on top with a 2-1 win at the Ed Meagher Arena, clinching a spot in the Réseau du sport étudiant du Québec (RSEQ) final, and in the national championship in London, Ont., in March. The first period was a tense affair with teams trading power plays and solid chances with no result. The deadlock was broken halfway through the second period when Stingers captain and defenceman Marie-Joëlle Allard put home a rebound following a hectic scramble in front of the Gee-Gees net. When Allard scored, four Gee-Gees, the goalie and even the referee were all lying on the ice. Forward Sophie Gagnon (#11) scored one goal in the series. Photo by Alex Hutchins. As the second period was winding down and the Stingers upped the offensive pressure, a stray rebound found its way onto forward Lidia Fillion’s stick, and she made no mistake, giving the Stingers a 2-0 lead. The home crowd was buzzing with the thought of potentially going to the finals for a second-straight year. One of hockey’s favourite clichés is that a two-goal lead is the worst lead to have, and that seemed to be accurate as the Gee-Gees came out flying in the third period. They scored just two minutes into the third period. The Ottawa side kept up the pressure, launching attack after attack, but were ultimately frustrated by Stingers goalie Alice Philbert. The rookie made several game-saving stops, including a desperate, sprawling save with three seconds left on the clock to secure the win. Another standout player was Stingers forward Claudia Dubois, who has been one the team’s best players this season. After leading the team in the regular season with 20 points, she had two assists in this series. The pressure and intensity from this game was a far cry from the display on Saturday, as head coach Julie Chu pointed out following the win. The Stingers will now play against the Université de Montréal Carabins in the finals, a team they have played five times this season, with every game going into overtime or a shootout. The Stingers had a 3-0-2 record against them this season. The series will begin on March 1.